Dimensions: central panel: 90 x 60 in. ; wings: 73 x 24 1/2 in. 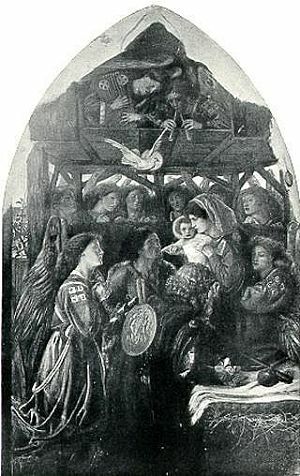 Note: Ruth Herbert was the original model for the head of the Virgin. Note: DGR substituted Jane Burden Morris's head for Ruth Herbert's in 1861. Note: Arthur Hughes's daughter Agnes was the model for the Christ Child. 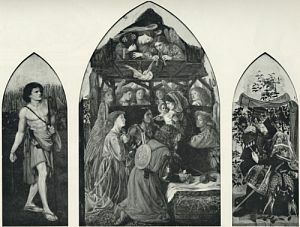 Note: Edward Burne-Jones may be the model for the shepherd in the center panel. Note: Surtees writes, “In the summer of 1860 Rossetti had ‘an Italian (of Parmigiano)’ sitting for him, though for which figure is not known” (Surtees, A Catalogue Raisonné , vol. 1, 58). 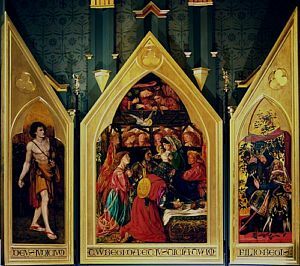 Note: The head of King David in the right wing is taken from William Morris. 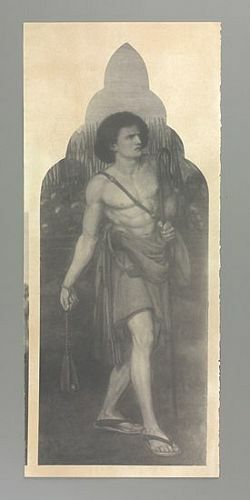 Note: Fanny Cornforth claimed that her husband Timothy Hughes sat for the figure of David in the left wing. Ash, Dante Gabriel Rossetti, plate 9. Masterpieces of DGR (Gowans and Gray) , 16-18. 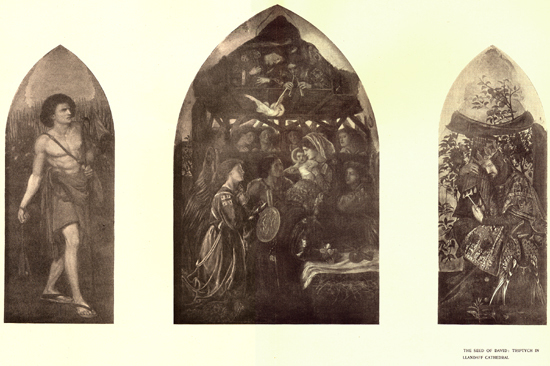 Marillier, DGR: An Illustrated Memorial , 74, [74averso], 110. 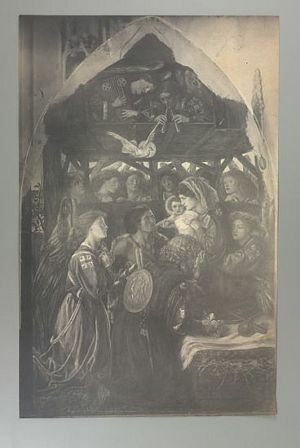 Radford, Dante Gabriel Rossetti , xvii, 13-15. WMR, DGR as Designer and Writer , 67. Sharp, DGR: A Record and a Study , 170-71. Surtees, A Catalogue Raisonné , vol. 1, 58-60 (no. 105). Surtees, A Catalogue Raisonné , vol. 2, plate 139. Marillier, DGR: An Illustrated Memorial , 74-75. Radford, Dante Gabriel Rossetti , 13. 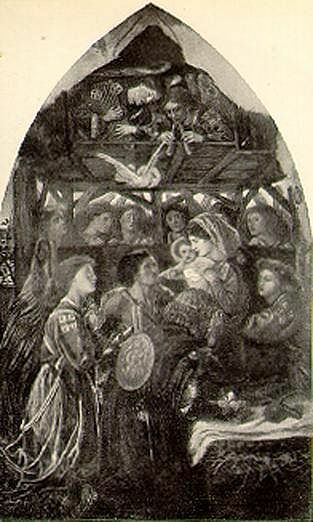 Radford, Dante Gabriel Rossetti , 14. Radford, Dante Gabriel Rossetti , 15. Masterpieces of DGR (Gowans and Gray), 16. Masterpieces of DGR (Gowans and Gray), 17. Masterpieces of DGR (Gowans and Gray), 18.